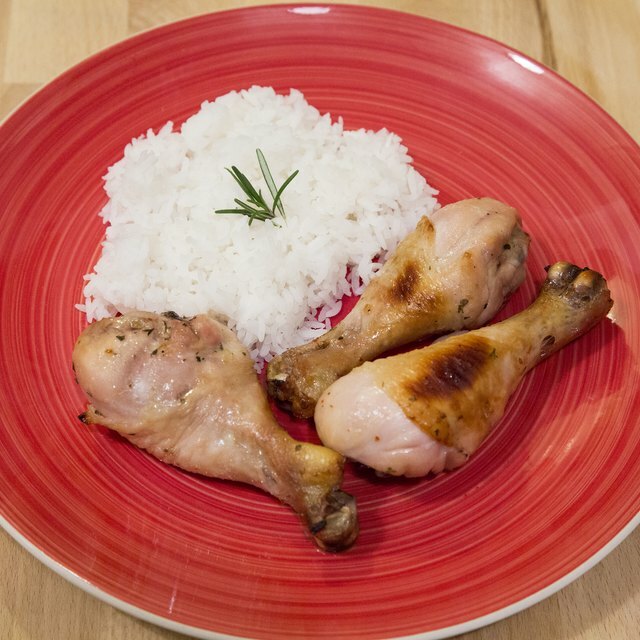 Chicken leg quarters are often more economical than pre-seperated legs and thighs. When you want more than just a drumstick, but don't have the time to prepare a whole roast bird, chicken leg quarters offer a happy medium -- you get the whole thigh in addition to the lower leg section of the chicken. For a simple preparation that's big on flavor, it doesn't get much easier than covering the chicken with Italian dressing and baking it in the oven. The dressing adds plenty of zesty Italian flavors and provides all the oil you need for cooking. Place your chicken leg quarters in large freezer bags and cover the chicken with Italian dressing. Seal the bags and let the chicken marinate in the dressing overnight. Turn the bags every few hours so the chicken gets evenly marinated. Preheat the oven to 375 degrees Fahrenheit when you are ready to cook. Remove the chicken from the refrigerator and pour out the excess marinade. Season the chicken wings lightly with salt and pepper, then place the leg quarters inside of an ungreased baking pan. The pan should be large enough so that the chicken quarters are not too tightly packed together. Pour fresh Italian dressing over the chicken, turning the chicken in the pan to coat both sides. Alternatively, you can mix the Italian dressing with an equal amount of mayonnaise and brush it onto both sides of the chicken. The mayonnaise adds more flavor, as well as helps to produce a crispier skin. Cover the baking pan with aluminum foil and place in the oven to bake for about 30 minutes. Remove the aluminum foil and add more dressing over the chicken before letting it cook uncovered for another 30 minutes or so. The chicken legs are done when the skins are golden brown and a meat thermometer inserted into the thickest part of each leg quarter reads 165 F, the minimum temperature for safe consumption of chicken. If you prefer not to eat the chicken skin, wait to take them off until after the chicken legs have cooked. The skin helps keep the chicken moist while it is cooking in the oven. Do not use any of the dressing you used to marinate the chicken for any other purpose, as it has been contaminated with bacteria from the raw chicken. Always use new dressing fresh from the bottle. The Kitchn: Handling Raw Chicken: To Rinse or Not To Rinse? 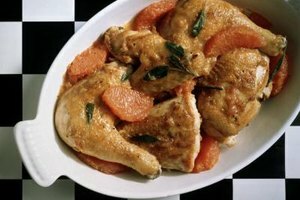 How Do I Roast a Split Chicken in the Oven? How Do You Tuck the Wings to Roast a Chicken?